The entire meal takes a maximum of 10 minutes to prep and then it’s hot and ready for your family when you want it, fresh from the thermal cooker. Even calling it a “recipe” feels like a bit of a stretch. It has so few ingredients and does use a prepared mix for the sauce. C’est la vie during soccer season, mes amies. My family asks for this over and over again. Who am I to deny them? No one. That’s who. It’s fast, easy, cheap, hot, and yummy. And thusly I comply with their demands. This is another rice recipe so you prepare the rice by boiling water with a little salt, adding the rice and boiling it for a few minutes. Then you insert it into the thermal cooker. Detailed instructions to guide you through this incredibly detailed process can be found here. 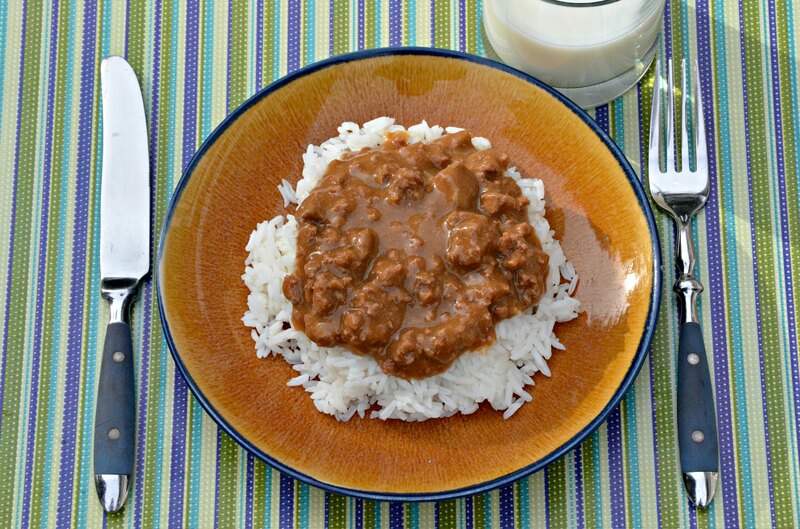 The topping for the rice is made by browning some ground beef or turkey in the main pot. You then drain the meat and set it aside. Prepare a few packets of brown gravy mix in the pot. When is starts to boil, add the meat back in and boil for 3-5 minutes. Then stick it in the pot. Nest the boiling rice inside. Put a lid on it. And seal. This will be done and ready to eat as soon as the rice is cooked through, about 2 hours, but it should stay good for up to 8. Of course check the temperature to make sure your particular has kept it hot enough for food safety. This afternoon I made this as I helped my kids with their homework. Then I forgot about it until we got home from soccer at 7 pm. Score. 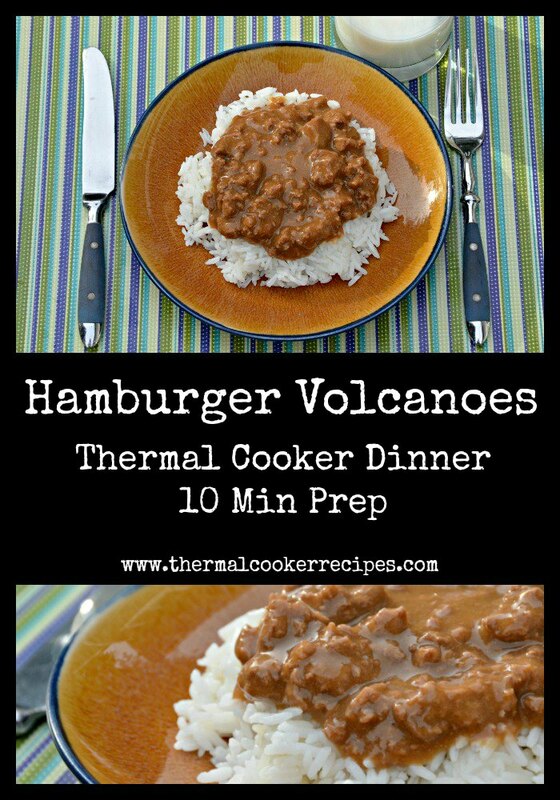 As a side note, we call these “volcanoes” because my mom used to make this meal with mashed potatoes. We’d form the potatoes into mountainous shapes and then fill the hole in the top with the meat and gravy “lava.” It’s not nearly as volcanic-looking with rice, but the principle’s the same and the name stuck. Brown meat in large thermal cooker pot. Prepare brown gravy mix in large thermal cooker pot according to package directions. When gravy begins to boil, add prepared meat. Place large thermal cooker pot in thermal cooker unit, cover with lid, and seal. Wait 2-8 hours and enjoy over rice.